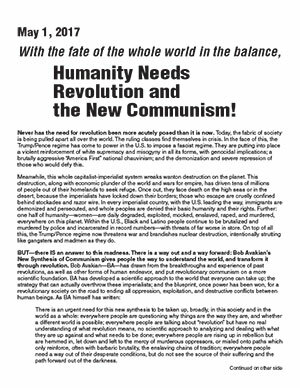 May 1, 2017 - With the fate of the whole world in the balance, Humanity Needs Revolution and the New Communism! Never has the need for revolution been more acutely posed than it is now. Today, the fabric of society is being pulled apart all over the world. The ruling classes find themselves in crisis. In the face of this, the Trump/Pence regime has come to power in the U.S. to impose a fascist regime. They are putting into place a violent reinforcement of white supremacy and misogyny in all its forms, with genocidal implications; a brutally aggressive “America First” national chauvinism; and the demonization and severe repression of those who would defy this. Meanwhile, this whole capitalist-imperialist system wreaks wanton destruction on the planet. This destruction, along with economic plunder of the world and wars for empire, has driven tens of millions of people out of their homelands to seek refuge. Once out, they face death on the high seas or in the desert, because the imperialists have locked down their borders; those who escape are cruelly confined behind stockades and razor wire. In every imperialist country, with the U.S. leading the way, immigrants are demonized and persecuted, and whole peoples are denied their basic humanity and their rights. Further: one half of humanity—women—are daily degraded, exploited, mocked, enslaved, raped, and murdered, everywhere on this planet. Within the U.S., Black and Latino people continue to be brutalized and murdered by police and incarcerated in record numbers—with threats of far worse in store. On top of all this, the Trump/Pence regime now threatens war and brandishes nuclear destruction, intentionally strutting like gangsters and madmen as they do. On the basis of this new communism, the movement for revolution fights the power, and transforms the people, for revolution. This means joining with, leading, and organizing masses of people to fight back against the attacks of this system. It means struggling with all the backward values, ideas, and ways of thinking that reinforce and lead back into this system and struggling for those ideas that contribute to human emancipation; without such struggle, there will never be a revolution. The key to all this is BA—bringing his method and approach, his work, and the many, many ways he provides leadership for the battles right now into the center of all this movement does. This activity is urgent, and aimed at a specific goal. Right now, today: Prepare the ground, prepare the people, prepare the vanguard for revolution—get ready for the time when millions can be led to fight, all-out, with a real chance to win. Follow the leadership of Bob Avakian in all this, and get organized into the Revolutionary Communist Party to carry it through. Rarely if ever has there been such a direct danger to even the continued existence of humanity as there is today; yet, on the basis of taking up the revolutionary way forward, the potential is there to make a world truly fit for human beings. The path has been forged to take up the struggle to make revolution, all over the world, and to emancipate all of humanity. Now is the time for YOU to take up this great cause. Where revolutionary forces do not yet exist, take up the new communism and organize such forces; where such revolutionary forces have taken up the new communism, join with them and strengthen them. The time is now; the situation is urgent; the struggle must be intensified.